U.S. Sen. Bernie Sanders on Monday accepted an invitation from CNN to debate Hillary Clinton in Brooklyn on April 14 before the New York Democratic Party primary election. “Sen. Sanders has accepted another invitation to debate Hillary Clinton in New York. We are glad that she finally has agreed,” said Michael Briggs, Sanders’ spokesman. “Sanders all along has pressed for a debate on television in prime time so the greatest number of New Yorkers and Americans may listen to the candidates and decide for themselves who has the best ideas about how to reform our rigged economy and the corrupt campaign finance system. It’s great for the people of New York that there will be a debate in Brooklyn, something that the Clinton campaign has long opposed. CNN invited Sanders and Clinton to the debate ahead of New York’s April 19 Democratic Party primary election. Sanders previously accepted NBC’s invitation to a prime-time debate next Sunday but that date conflicted with Clinton’s heavy schedule of high-dollar fundraisers, including one on that date in Virginia. Both the Sanders and Clinton campaigns agreed last January to hold an additional debate in April and another in May. 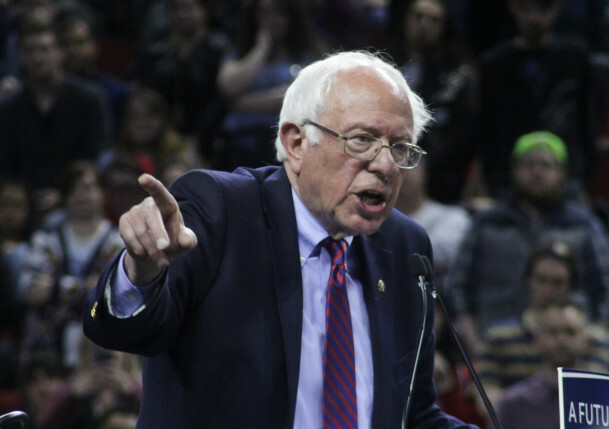 Sanders was in Wisconsin on Monday appearing at rallies in Milwaukee, Green Bay and Janesville ahead of Tuesday’s primary. The Sanders campaign also announced a series of celebrity endorsement videos with the release of this first one with Mark Ruffalo and Matthew Cooke. I knew she cave she always does .She just always has to hateful first.